Naritasan Shinshoji Temple (成田山新勝寺) is Shingon Buddhist temple located in Narita. It is one of the most famous temple in Kanto region. 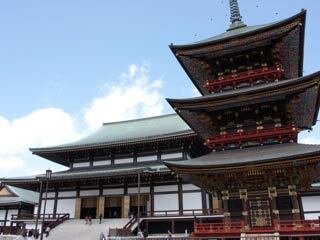 It has been the sacred spots to regain the protection against disasters and bad luck since established in 940. Especially, during the Edo Period, it was one of the biggest events for Edo people to visit and pray at Shinshoji Temple. Famous Kabuki Actor, Ichikawa Danjuro, prayed for his baby, and after his safe carriage of his baby, he was great believer of Shinshoji Temple and made a great connection between Kabuki and Shinshoji Temple. The image of Fudomyoo, the main deity of the temple, is belonging to the Chisan Sect of Shingon. This is an extremely valuable image that Kobou Daishi (the founder of SHingon) himself carved, consecrated and conducted a Goma rite upon the direct order of Emperor Saga. The image was enshrined at Takaosan Jingoji Temple in Kyoto for a long period of time. At the time of a revolt by Taira no Masakado in 939, the great monk Kancho carried the image to the Kanto region with him on secret orders from Emperor Suzaku. At Narita, in the Shimousa region, Kancho offered a Goma rite prayer for peace lasting 21 days. On 14th of February 940, upon the final day of the prayer, the revolt was suppressed. After this, Naritasan was founded and honored with the temple name, Shinshoji. ... enshrines the image of Fudomyoo, the main deity. Current building is built in 1968. It is the main dojo for the Goma rite that is the most important service in the Temple. The inside of the hall are enshrined the images of Fudomyoo. Built in 1712. The pagoda is 25m high, and the important cultural property of Japan. Gochianyorai is enshrined inside the pagoda. Rebuilt in 1831. Enshrined here are the images of Misshakukongo and Naraenkongo on the right and left front sides. Rebuilt in 1701. It was formerly the Main Hall. Rebuilt in 1858. This is the old Main Hall. Enshrined here are the images of Shakayorai Buddha in the center, and four images of Bosatsu. ... was built in 1984.